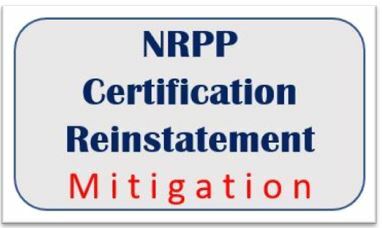 Applicable for Reinstatement of NRPP Mitigation OR Measurement and Mitigation Certifications that have lapsed more than one year, but less than two years from reapplication date. A review of the entry level measurement and mitigation courses. 32 CE credits. This 32 hour CE course is a review of both entry level measurement and mitigation courses and approved for the purpose of reinstating NRPP Mitigation OR Measurement and Mitigation Certifications that have lapsed more than one year, but less than two years from reapplication date. With both courses there is approximately 32 hours of coursework, including video, audio, resources, and quizzes that are taken as you progress through the course (not timed and may be taken unlimited times). There is no time limit for taking the course, and even after completion you continue to have access to the course in order to refer back to resources.